Alpha Delphini, trained by Bryan Smart and ridden by Graham Lee, edged out Tom Eaves and Mabs Cross by the smallest of margins after the pair looked inseparable as they crossed the line. It was several minutes before the result of the photo finish was announced, adding to the incredible tension. There was a blistering pace from the outset with speedsters Take Cover and Caspian Prince blazing the trail, and Alpha Delphini and Battaash hot on their heels. Battaash hit the front about a furlong and half out, but could not put the race to bed and Charlie Hills’ sprinter was left standing in the final 100 yards, as the Michael Dods-trained Mabs Cross and Alpha Delphini fought it out, with just a nose separating them. Blue Point, winner of the King’s Stand Stakes, was third. North Yorkshire-based Smart said: “That was the longest five minutes of my life! “I backed him this morning, I had a tenner each-way at 80-1 because I thought that was an insulting price. “I knew I had him the best he’d ever been, I’d trained him for this race as it was one I’d always wanted to win. “I’d told the wife months ago that he was going to be absolutely spot-on for this, he was just coming right. “There was a difference today, he was so relaxed, he wasn’t sweating or anything. 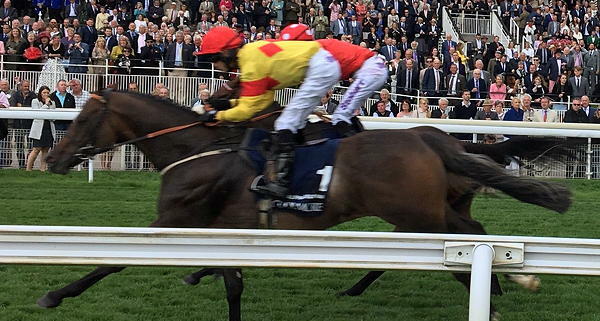 “Credit must go to Graham Lee, it was his idea to take the cheekpieces off as he felt that that he couldn’t see the other horses when they came at him. He went on: “My wife treats this horse like a king at home, he has back problems and gets treated like he owns the place. “I’ve had a lot of his family, his half-brother Tangerine Trees got better with age and it looks like he is. Lee – who won the Grand National on Amberleigh House in 2004 – said: “The longer we were waiting I was sure it was a dead-heat. Obviously I’m delighted, but sorry for Tom. Dods was gracious in defeat and said: “She’s run a super race. Obviously we’d rather have won, but what can you do. “As I said to Bryan Smart waiting for the result, I would have settled for a dead-heat and he said the same. “When it’s that close you’re disappointed to get beat, but I’m very pleased with her. “She’s in the Flying Five at the Curragh. Whether we go there or go straight for the Prix de l’Abbaye, we’ll see. To rub salt into the wounds for Eaves, he was given a four-day whip ban by the stewards. Charlie Appleby said of third home Blue Point: “I’m pleased. We beat the horse that everyone thought was the one to beat. “They’re proper speedballs there today and as William (Buick) said, he’s definitely a five-furlong horse. “We just got a bit outpaced at halfway, but he was coming back at the end. Hills said of the vanquished Battaash, who had got very worked up before being beaten in the race 12 months ago: “He pretty much ran exactly the same as last year. The only difference was he didn’t get worked up beforehand. “He was probably the last horse off the bridle and never really picked up. “He’s as good as gold after the race. It’s just one of those things. His rider Jim Crowley said: “I don’t know what to say. He ran a very similar race to what he did last year. “He didn’t get upset in any way and travelled away nicely. He travelled within himself for the first half of the race and just didn’t have any kick. “I was upsides the winner and he just had no kick today.